Namita Das has two grown up children, but she continues to suckle her pet monkey. 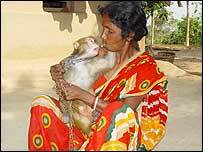 Namita, a middle-aged woman who lives in India's north-eastern Tripura state and is a government worker, describes Buru, the pet monkey, as her third child. "Yes, I breastfeed him. He is my son," says Namita, caressing the monkey. More than four years ago, her woodcutter husband found a dying baby monkey under a tree after a fierce storm. He brought the animal home in Chandrapur village on the outskirts of the Udaipur town in Tripura's South District. "The monkey fell ill after the storm , in which it lost its parents. I decided to bring him up with my daughters," says Namita. Her daughters, Dipti and Tripiti, treat the monkey as a sibling. "We tie rakhi (a sacred thread) on Buru's wrists during the Indian festival when sisters wish their brothers well," says Dipti, the elder of the two. Namita and her husband manage to earn around $100 together every month and barely manage to make ends meet. But that does not deter Namita from spending to bring up the monkey. It is not uncommon for poor rural families in Tripura to keep pets. But Namita is upset when a photographer accompanying me calls the monkey a pet. "This is not a pet, this is my son. Please get that right," she insists. "I did not have a son. 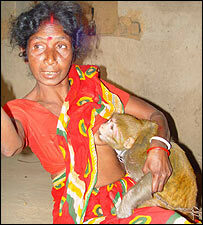 God finally gave me one," says Namita, as she continued to breastfeed the monkey. I ask her whether she has been breastfeeding Buru- who is around five years old- for too long. "I will continue to breastfeed him as long as he wants it. He will always remain a little one for me," she says. She says she also feeds her pet monkey "expensive cow milk" which she could not afford for her children. Many Indian mothers pamper their sons and give them what is denied to daughters. They believe the family is not complete without a son and crave for one. But it is rare for anyone to adopt a monkey. Namita's neighbours find her behaviour with the monkey "somewhat abnormal". "We keep pets but to treat a monkey as a human or as your own child is not normal," says Subal Paul of Chandrapur village. 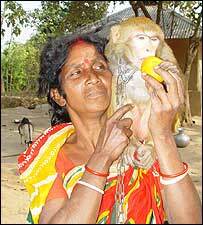 Another neighbour Ramesh Sil says Namita is "overdoing her affection for the monkey". Buru generally stays home but is often seen on the roof of neighbours' homes, stealing bananas. The neighbours complain but Namita refuses to put Buru in chains. "Our pets are in chains, but this monkey is far too pampered," says Meena Das, a relative. But all this does not deter Buru's doting 'mother'. "I don't care what they say. Buru is my son," she says.